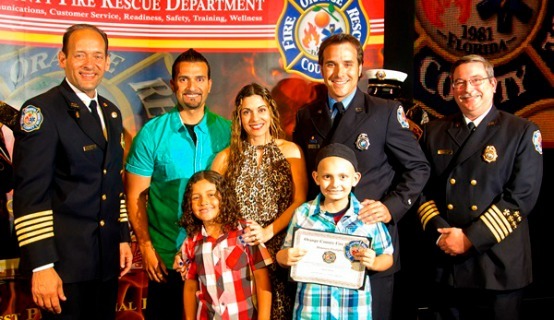 Orange County Fire Rescue recognized 10-year-old Jared Santos as an Honorary Firefighter on April 15, during an Employee Recognition Ceremony at Full Sail Live. The Ceremony was held to congratulate Fire Rescue employees on their recent promotions and to award several individuals for outstanding performance. Orange County Fire Rescue Engineer Jesse Harris recently met Jared while volunteering at the Ronald McDonald House in Orlando. Jared, who suffers from a rare bone disease, constantly makes trips with his family from Brevard County to Orlando to receive his treatments. When Harris met Jared, he learned of Jared’s interest and admiration for the fire service. Since then, Harris has made a great effort to stay in touch with Jared and his family by continuing to volunteer at the Ronald McDonald House. Harris arranged for Jared and his family to tour a fire station and ride in a fire engine during one of their visits to Orlando. He made sure Jared always left with a new hat, T-shirt and, more importantly, a smile on his face. Jared was celebrated during the Special Recognition portion of the ceremony. He was called upon to stand on stage with Chief Drozd, Division Chief of Operations Mike Wajda and Harris to receive his certificate as the newest Orange County Fire Rescue Honorary Firefighter.